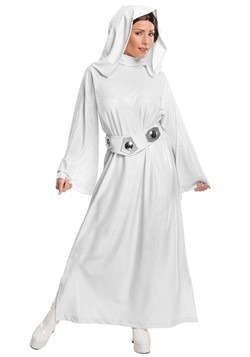 In a galaxy far, far away... wait, no, that's not right... you can get all the Star Wars costumes you could ever want right here in our galaxy at HalloweenCostumes.com. 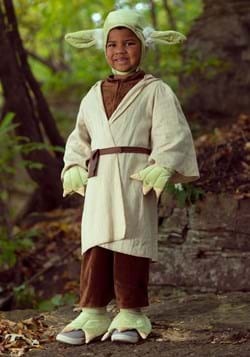 That's right, we have more Star Wars costumes here than Toshii Station has power converters. We've got everything you need to become one of the heroic Rebels or the evil Imperials, or a Jedi or a Sith and you don't even need to stumble upon a rare holocron. We've got lightsabers, blasters, armor, helmets... everything! Seriously, it's like the finest department store on Oruscant. 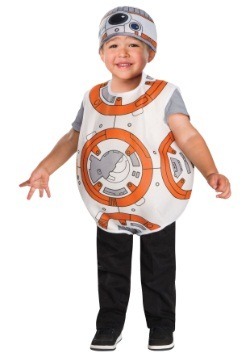 Our Star Wars Halloween costumes selection is so vast, it might just take a jump to lightspeed to get to the other side of it all. 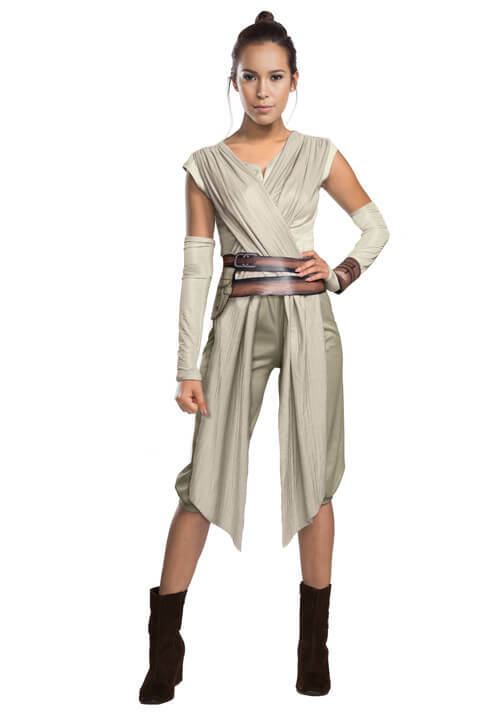 So, whether you're looking for costumes from the original trilogy, the prequal trilogy, the Clone Wars, Rebels, or even The Force Awakens, we've got you covered. 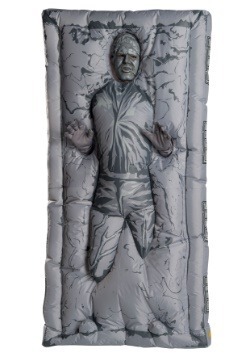 All your favorite characters like Luke Skywalker, Leia, Boba Fett, Chewbacca, and Vader can be found right here in your own galaxy, ready to ship all over the planet. No hyperspace required. 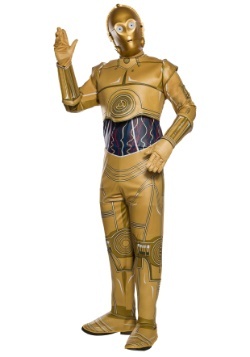 Search our collection of Star Wars costumes for the greatest look in the universe. 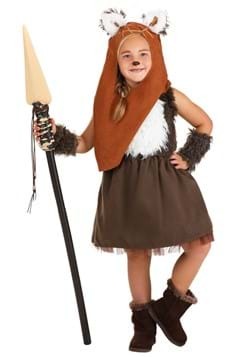 Find the best Star Wars outfits for adults and kids. 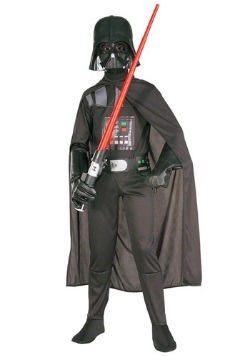 So no ordinary Star Wars costume is going to work for you because you want your look to be authentic! 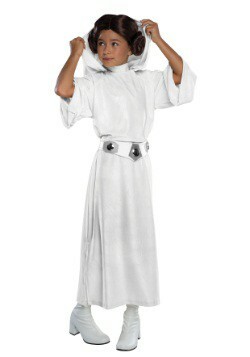 Fortunately, we have a great selection of supreme costumes (that may or may not have arrived by intergalactic freighter...). These costumes have movie replica details, and with heavy duty materials and construction, you'll be ready to star in the next sequel. 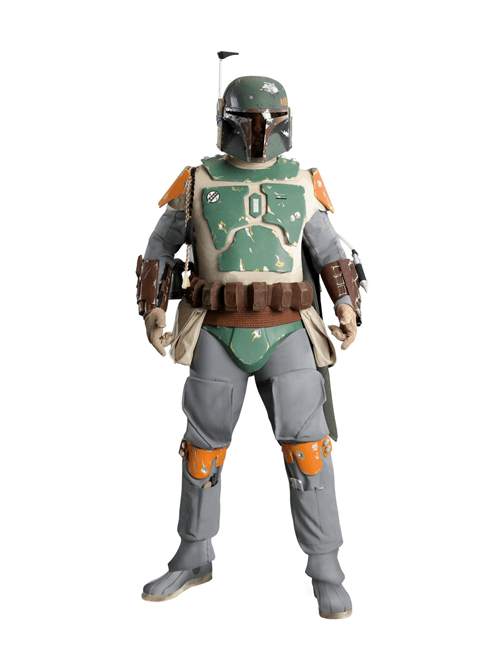 We particularly like the authentic villains with Boba Fett, a Stormtrooper or an Imperial Guardsman to lead the battle. 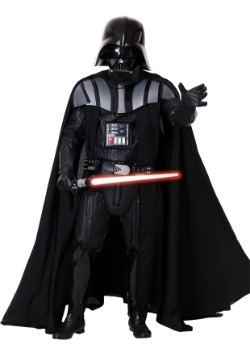 But if you truly feel the power of the Dark Side, the ultimate villain Darth Vader is available in a fantastic authentic edition costume (if you think you've got what it takes to fill his boots). 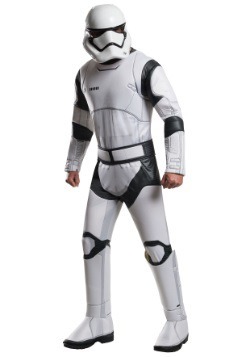 Stormtrooper down for what? You know what these guys are all about. Battling rebel scum, doing the bidding of their Emperor, and shooting their blaster guns with incredibly poor aim. If you'd like to suit up as a one of the Empire's foot soldiers, make sure you do it in an authentic Stormtrooper costume to make the best impression. 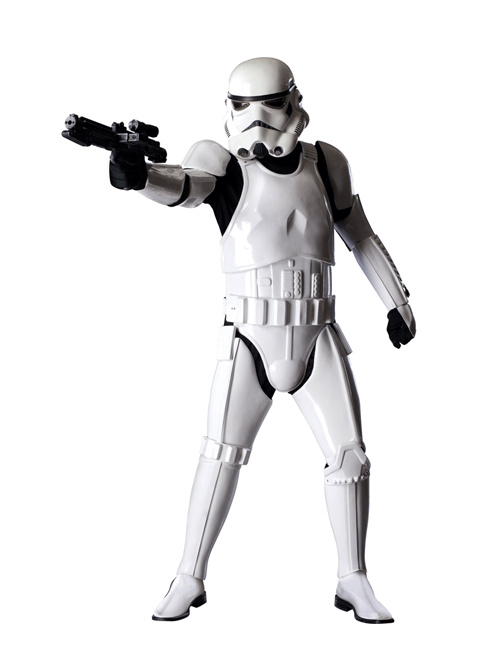 This supreme edition has the clunky armor pieces that made the troopers instantly recognizable in the original Star Wars films. 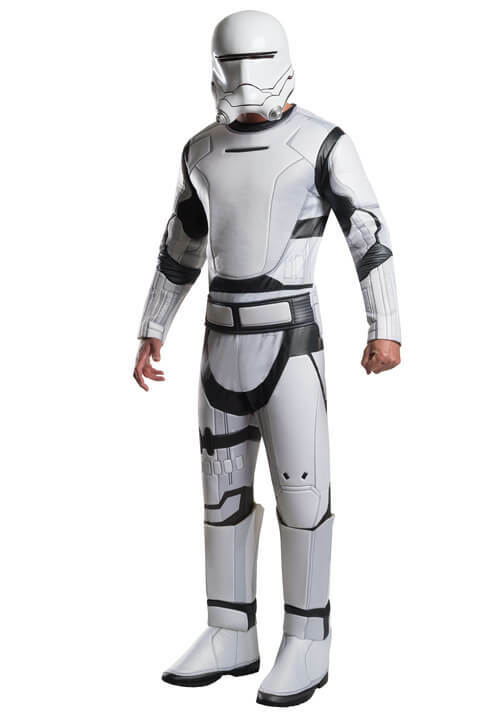 With EVA molded armor pieces, and a detailed helmet designed from the original on screen costumes, you're sure to be recognizable in this fantastic Star Wars look. 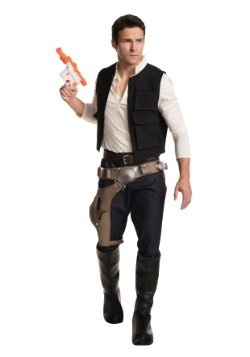 With the detailed pieces on this costume, the only thing you're going to need is a blaster! If you'd do whatever it takes to protect your Emperor, there is only one spot for you in the Imperial ranks. That of the Imperial Guard! 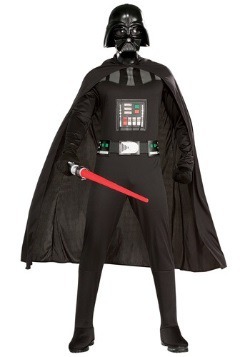 This authentic costume will transform you into one of Palpatine's protectors in supreme style. 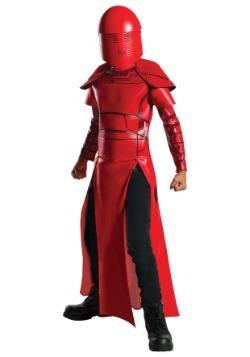 With a luxe crushed velvet robe, and intrinsically detailed replica helmet, you'll be ready to fly around in the Emperor's shuttle and help keep the Sith master in good shape. 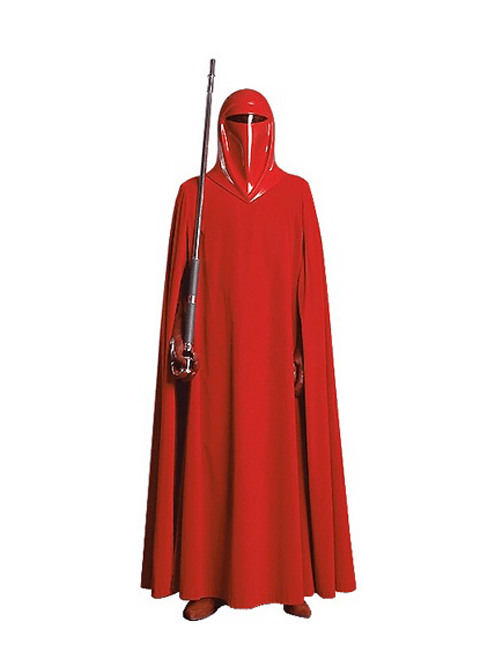 This Imperial Guard costume is the perfect choice to get in multiples for an amazing group costume. 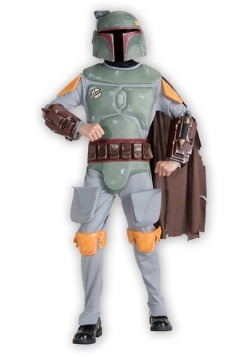 You can rest assured that your bounty is going to be paid out when you hire Boba Fett to do your bidding. 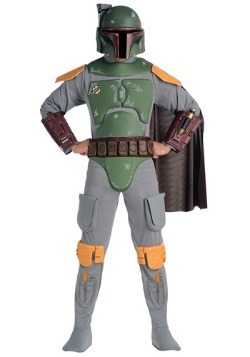 But if you'd like to try to collect yourself, make sure you go in this Supreme Edition Boba Fett costume. With hyper detailed molded armor pieces that look like they came straight from storage on the Slave I, you'll feel ready to step into the character's shoes and go after some serious bounties. 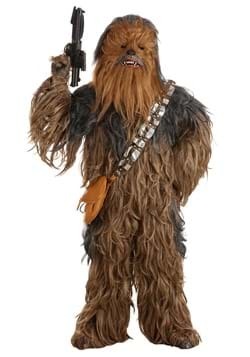 From the painted battle scar effects on the armor to the replica helmet (and even an attached Wookie braid!) 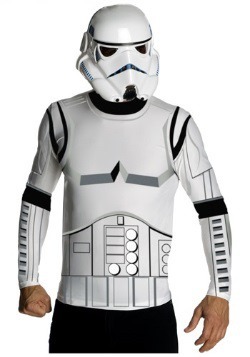 This intricately detailed costume will give you an authentic Star Wars look. If you've got a penchant for rebelling against evil Empires, chances are, you'd probably enjoy going in as one of your favorite Rebel heroes from Star Wars. With all of your favorite characters from a galaxy far, far away, we have all of the costume looks to let you help the Alliance to Restore the Republic defeat the evil Imperial army. We have a variety of costumes at every price point, so no matter which character you'd like to portray, we're sure to have a size, fit, and price that works for you! You just can't go wrong with the heroine of the prequel trilogy, Padme Amidala. As a queen and senator she always carries a regal air, but she's not afraid to mix it up in the action either! 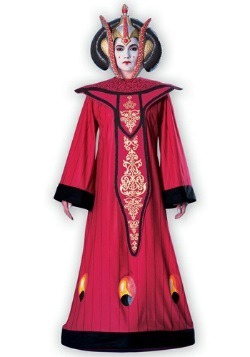 This classic Padme costume is one of her traveling costumes from Episode II. The jumpsuit means that she's ready for action, but the cape still projects her royal attitude. 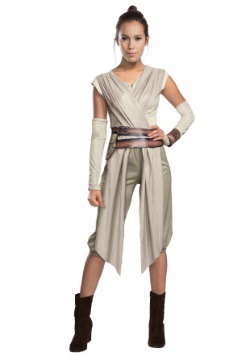 For an easy DIY modification you can grab a pair of scissors, and replicate her appearance with a torn top from the battle at the Geonosis arena. 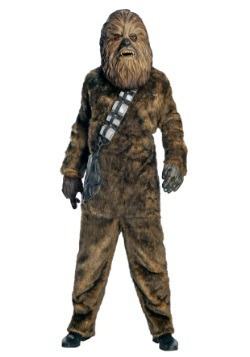 However you'd like to wear this authentic Star Wars look, you're sure to have an on-screen character look with this costume. 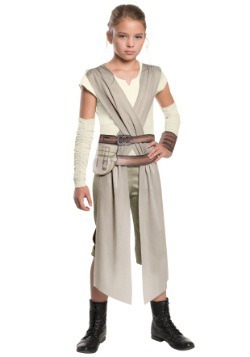 Anakin still wants to fight for the forces of good when he becomes a Padawan and a Jedi, so you can suit up in his prequel style with this detailed Jedi costume. 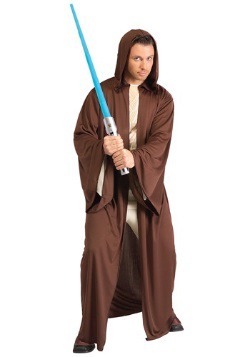 With an easy to wear top that resembles his tunic style Jedi uniform, this printed costume look will have you ready to go toe to toe with some serious villains. 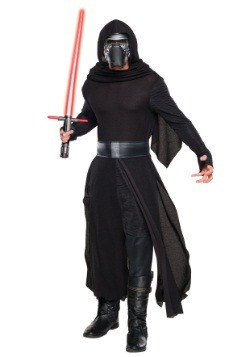 Grab a lightsaber and practice your dueling, because with this detailed ensemble, you're sure to be ready to be a part of the prequel action. There's not a more iconic female character in the entire Star Wars universe than Princess Leia. The famed princess has no problem with being a part of the action, and even though she's wearing an elegant gown, she's ready to fight the Empire at any and every opportunity. 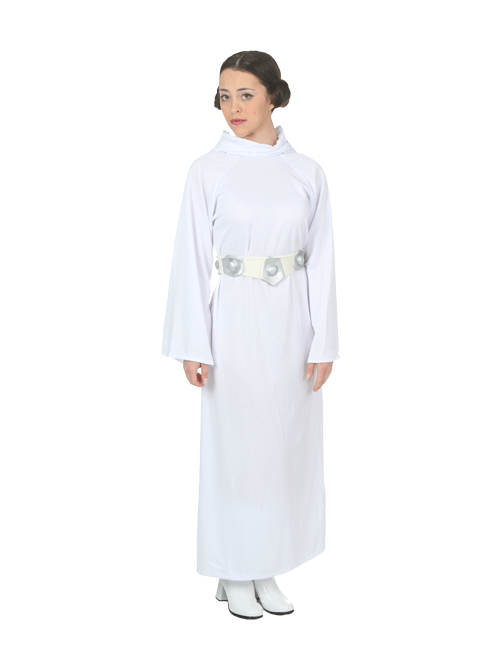 This costume gown is the perfect look to let you step into Leia's shoes. 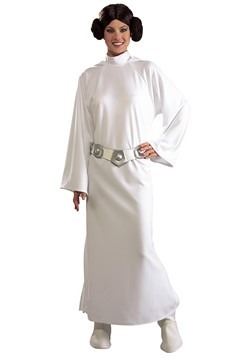 Styled from her appearance in A New Hope, it has the flowing look and costume belt that helped make her famous. 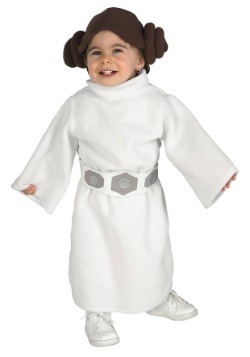 Just style your hair into buns, or use one of our Princess Leia wigs, and you're sure to look just like her! 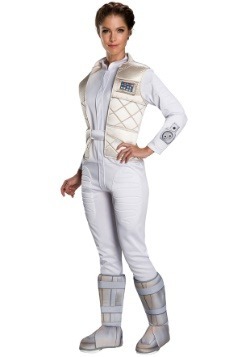 What better way to hop into the fight and battle the Empire than as a Rebel pilot? 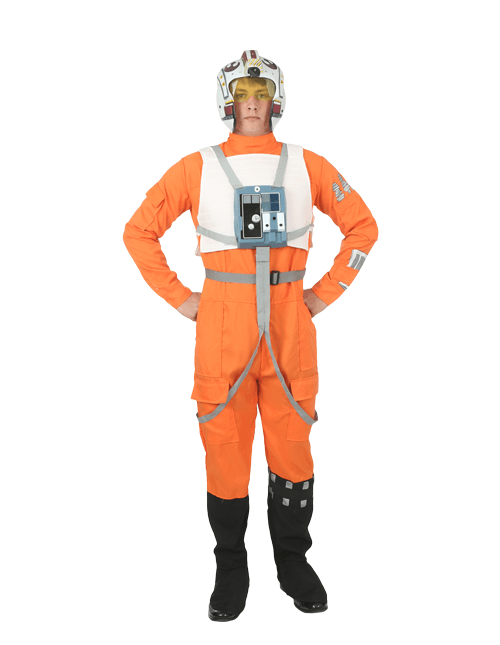 Of course, you could be Luke Skywalker when he pilots his X-Wing, but you could also portray Wedge Antilles, Poe Dameron, or a new character of your own creation. 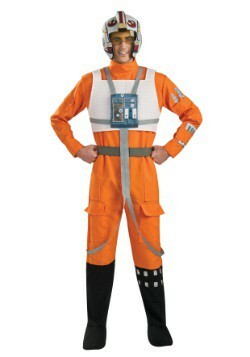 This orange jumpsuit costume perfectly captures the ragtag details of the X-Wing pilot's uniforms. 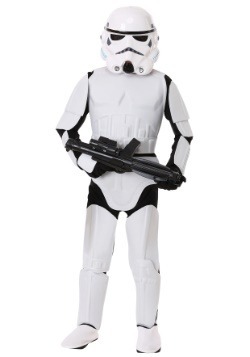 With a plastic chest box accessory, printed uniform greeblie details, and a replica Rebel fighter pilot helmet, you're sure to feel like you can take down the Empire all by yourself. Just remember to follow the lead of your Squadron Commander! 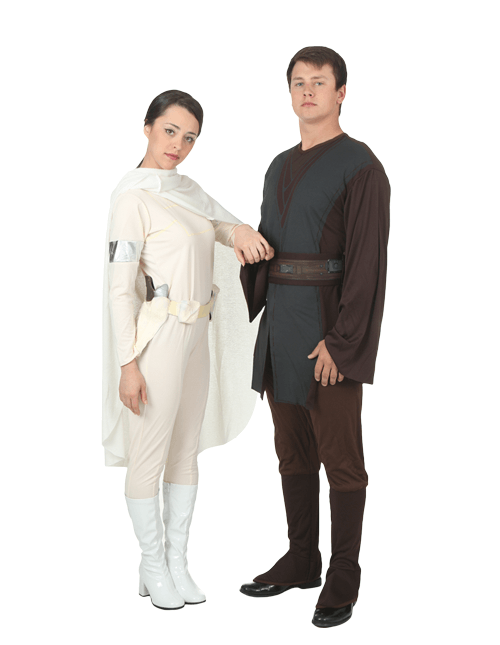 If you and your significant other have a yearning to team up as a pair of heroes, a Star Wars couples costume would be the perfect choice! You're sure to steal the scene when you go as one of the iconic romantic duos from the Star Wars universe, or at least you'll be able to put the Imperial baddies at your party on notice. With authentic movie details, coordinating a pair of costumes to become a Star Wars power couple is one of the most fun ways to have a good time in the galaxy far, far away! 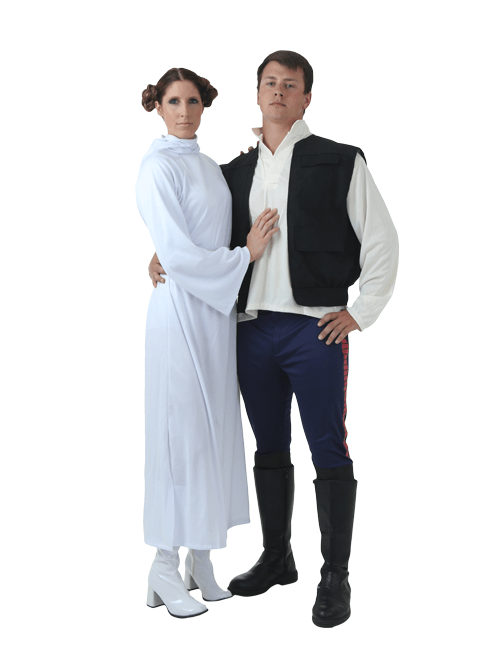 We're still amazed that a princess fell for a scruffy lookin' nerf herder, but when you coordinate Princess Leia and Han Solo costumes as a couples look, you're sure to bring some heat as these iconic characters. Leia's princess gown is the perfect touch to match Han's signature space cowboy look for the ultimate odd couple. Make sure to add some prop blaster weapons so you're both ready to fight the Empire! Of course, Padme Amidala and Anakin Skywalker are the secret power couple of the prequel series, so going in their costumes from Attack of the Clones will be the perfect way to get into the Star Wars universe action. 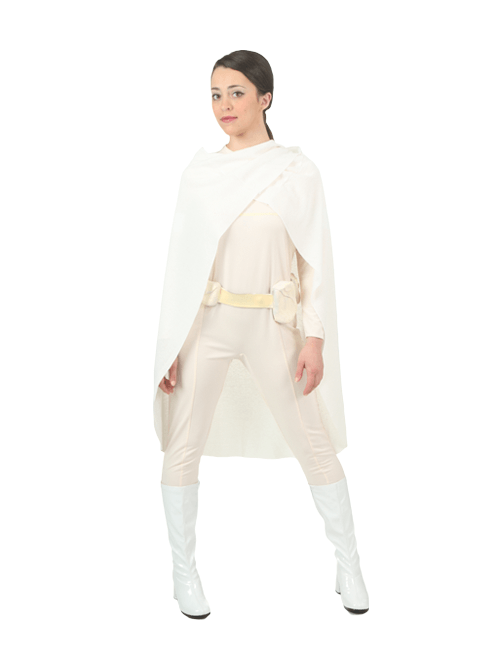 The stark white jumpsuit that Padme wore while traveling is a great contrast to the brown tunic of young Anakin. You're sure to make a grand entrance when you step into the party. And if you're stepping into the Geonosis arena... well, get ready for some intense action! With JJ Abram's The Force Awakens taking the world by storm in 2015, we have all rejoiced over having a new set of Star Wars heroes and villains to watch. 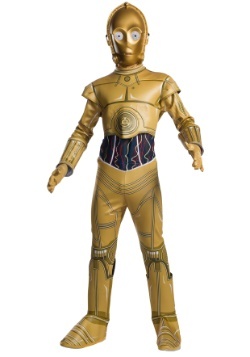 But with these authentic Episode 7 costumes, now you can step into the roles of the characters from the newest Star Wars installment. These detailed looks have signature details straight from the screen, so get ready to suit up for the Resistance or the First Order, and be prepared to have a great time! We all found out that Rey is a hero worth rooting for! 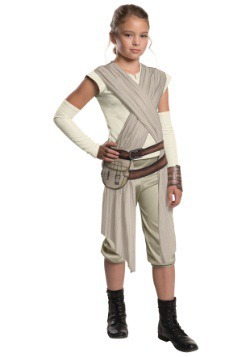 If you'd like to become the force sensitive backworld scavenger, just go in this deluxe Rey costume. With a cut that mimics her costume's rough-hewn appearance, you'll be instantly recognized as the desert heroine. Printed foam costume accents complete the look, and if you add a prop bo staff or lightsaber, you'll feel ready to battle Kylo Ren and the First Order yourself! There's still a lot of mystery over just how Han Solo and Princess Leia's son became the evil and tormented Kylo Ren, but there's no mystery over how awesome it is to portray him in costume. 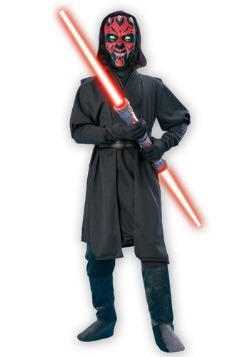 You can become the brooding Knight of Ren with this black tunic costume robe. The hooded cape will go over your head and when you wear the plastic mask, you'll instantly become Supreme Leader Snoke's right hand man. 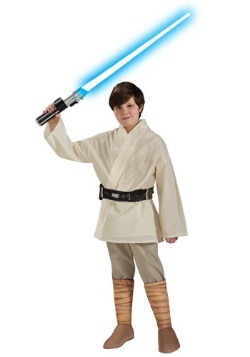 Just remember to accessorize with his signature lightsaber, and you'll be ready to battle the Resistance to the bitter end. We're still waiting to find out all about Captain Phasma after her appearance in Episode 7, but one thing's for sure. 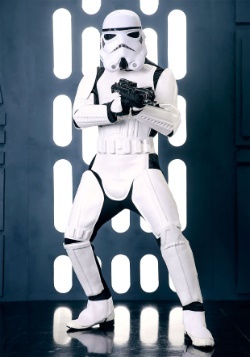 Stormtroopers look really cool in chromed armor! 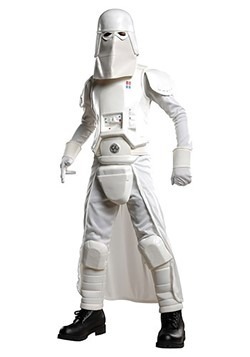 This new leader of the Resistance's Stormtrooper division is tough, tall, and intimidating, and you can step into her shoes with this deluxe Star Wars look. 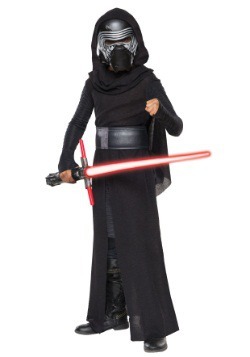 With painted polyurethane foam costume components, and with a cape and replica helmet, you'll be ready to do all of Kylo Ren's bidding. Stormtroopers are back in The Force Awakens, and with just a few costume updates, they're still the foot soldiers we love to hate. 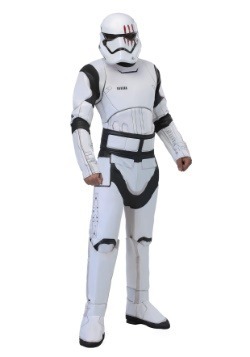 You can become one of the First Order's top brawlers when you go in this deluxe Episode 7 Stormtrooper costume. With foam armor pieces attached to a polyester jumpsuit, you'll be ready for action, or for posing for great pictures with this detailed look. 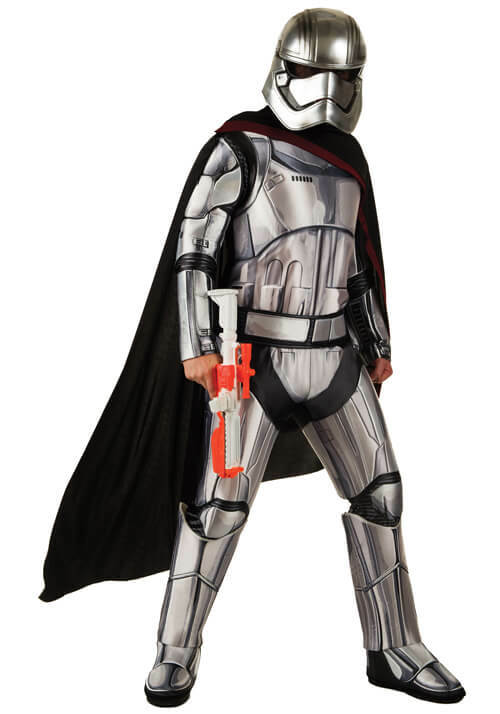 Put on the costume mask, and grab a blaster, and just be ready for Captain Phasma to give you your orders! Finn's an unlikely hero, an escaped agent of the First Order, and as it turns out a great costume choice for any Star Wars event! 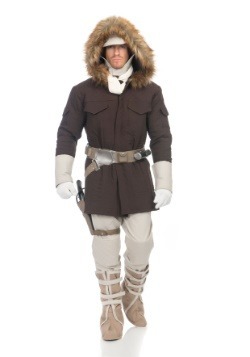 This deluxe Finn look captures his ragtag look after he separates from the First Order. 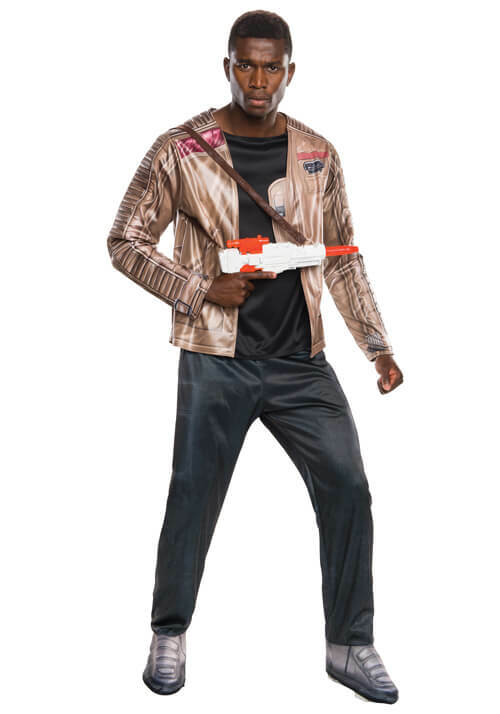 With a polyester jacket/shirt top that looks just like the one he borrowed from Poe Dameron, you'll be ready to run around on Jakku, or travel on the Millennium Falcon to far away planets. Try your luck with an accessory blaster or lightsaber, and get ready to be a part of The Force Awakens action! As we find out in Episode 7, the First Order doesn't just have a new batch of Stormtroopers... they have a whole division of Flametroopers to help complete their mission. 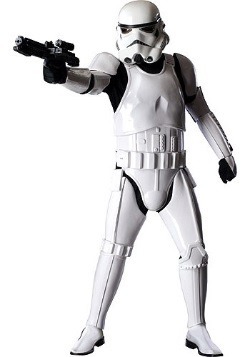 With a look derived from standard Stormtrooper armor, the Flametroopers have a signature helmet to set them apart. The foam padded jumpsuit of this costume captures the on screen look of these bad guys perfectly. Topped off with the signature helmet, you'll be ready to follow Captain Phasma's orders when you go in this deluxe Star Wars look. 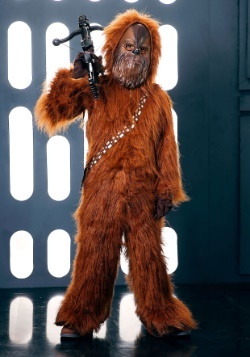 For serious Star Wars fans, you know that your favorite character's looks and costumes evolved over the course of the franchise. We've created this handy visual guide to help illustrate their evolution. 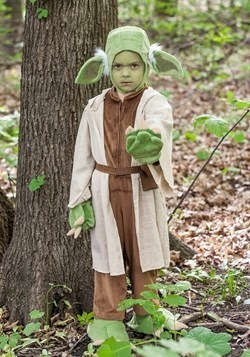 Check out this resource to help you compare movie details straight from the screen to help make your costume look more authentic or to find unique DIY touches to add the on-screen details to your unique Star Wars costume. 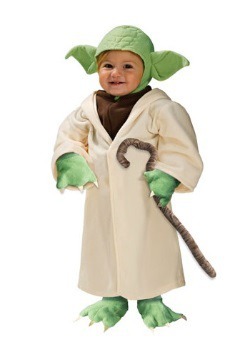 In the course of Luke's evolution through the original Star Wars trilogy, he grew from his humble beginnings as a Tatooine farm boy in A New Hope to become a Jedi Master in Return of the Jedi. 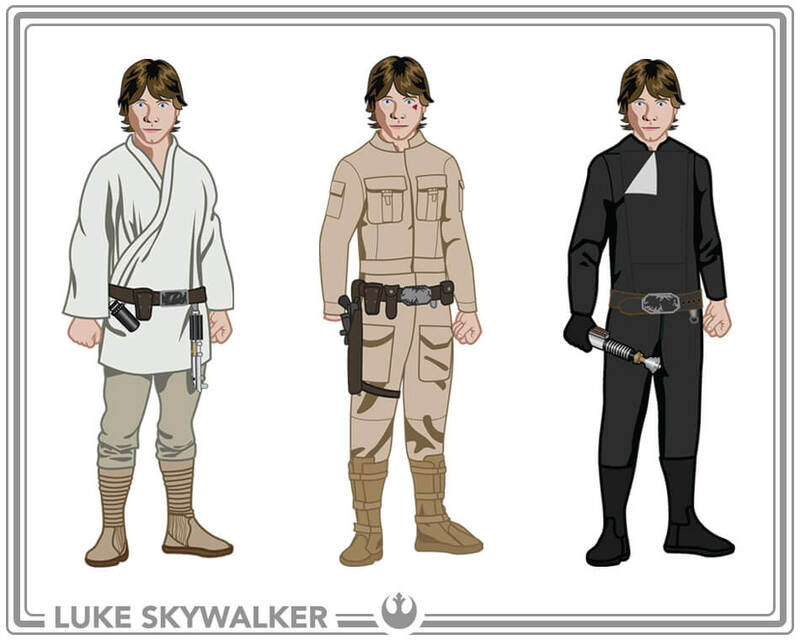 Luke's costume in the first film was meant to portray a look that was both simple and practical. A basic Japanese shirt with elongated sleeves, white trousers and Chelsea style boots would serve as his costume through the movie. 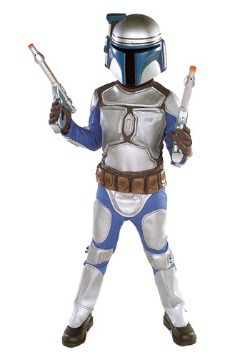 Accessories included a brown leather belt with multiple pouches, a lightsaber hook and knee high wraps. By the time of Empire Strikes Back, Luke's costume has evolved into a standard Rebel combat suit with some unique costume touches. 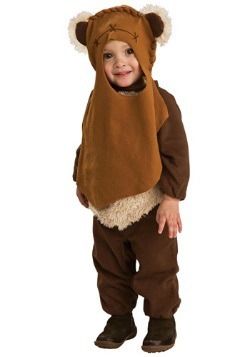 Comprised of khaki wool and featuring accent pockets, this costume was also complete with a leather accessory belt. 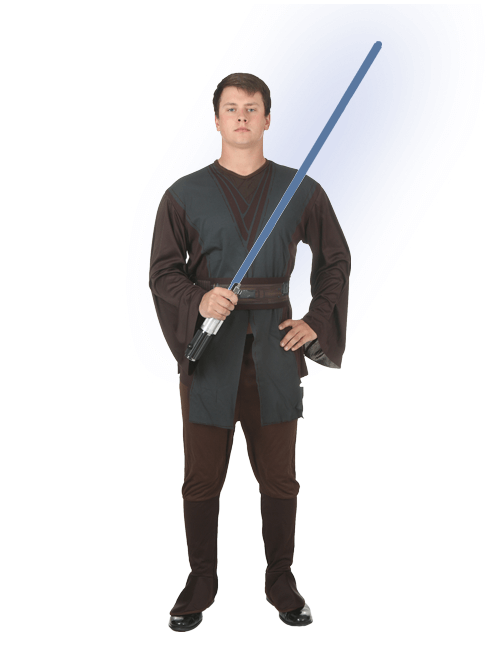 By the time he becomes a Jedi, Luke's apparel has turned into a stark black jumpsuit covered by a raw silk kimono, a look that is ominous and full of mystery. 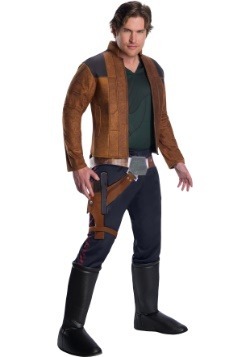 Han's costume had to help define his rogue nature so a very plain Viyella shirt and a pocketed vest, blue pants with tuxedo style segmented stripes along with a handcrafted leather gun belt and English riding boots would serve as his space cowboy-like costume. 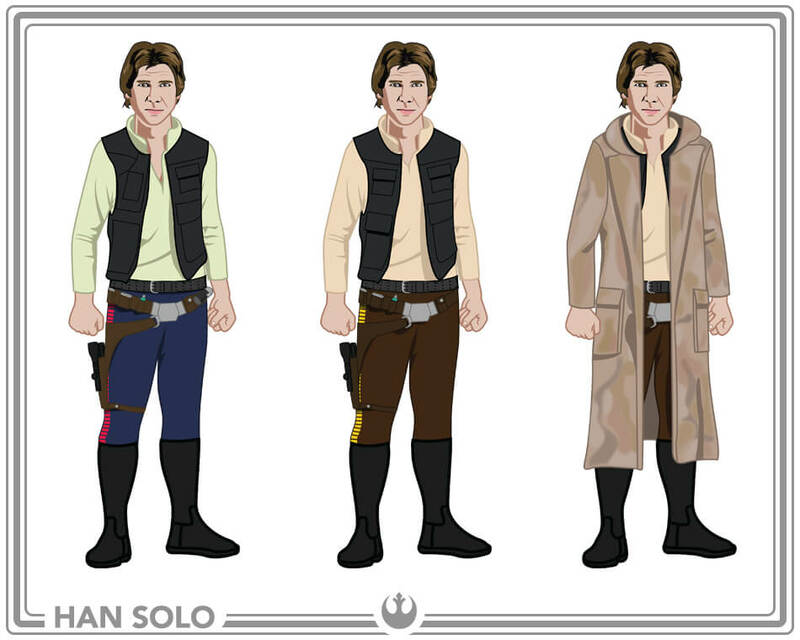 Only minor costume changes were implemented for his Empire Strike Back look, including a new western style plastron shirt replacing the previous one. A jacket similar to his original vest, along with similar boots and a gun belt finished his costume look. 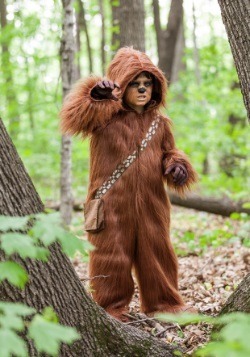 One of the few major costume changes throughout the trilogy involved the Endor mission, when Han donned a duster style coat. It was hand painted with an air-brushed camouflage pattern. Details on the jacket included large cargo pockets and a large slit up the back. 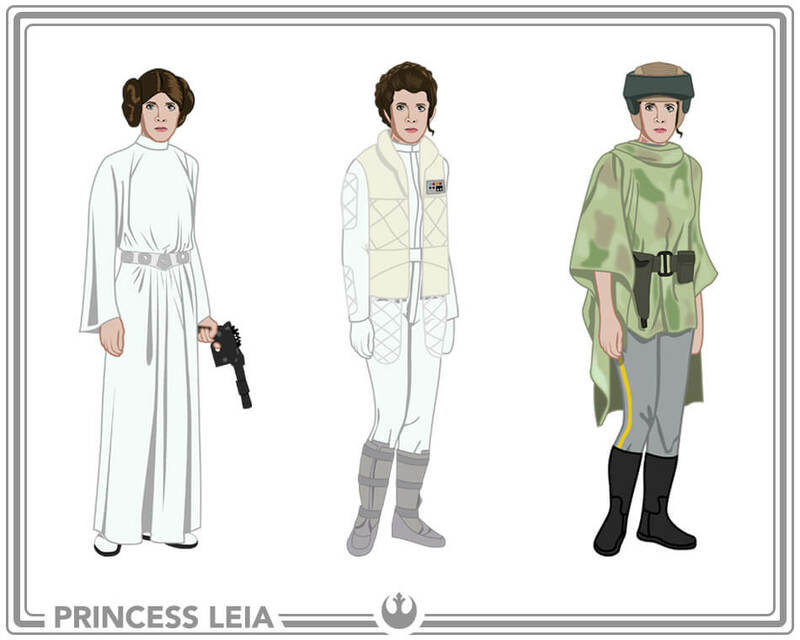 Leia starts her evolution as a Princess and a Senator, so her costume was fairly nondescript, yet still had a touch of elegance. A hooded gown made from crepe de chine featured open cut sleeves and was accented with a medieval style belt and knee high white boots. By the time of Empire Strikes Back, she has a new look as a leader of the Alliance to Restore the Republic. She wears a snow combat outfit that continues her established white pallete featuring a white jumpsuit and off-white thermal vest. 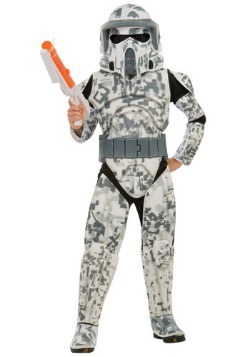 She then joins the Rebel command team on Endor in Return of the Jedi, and wears the same camouflage outfitted gear as the rest of the squad. Her camouflaged poncho covered gabardine combat trousers and was accented with a custom helmet and English riding boots. 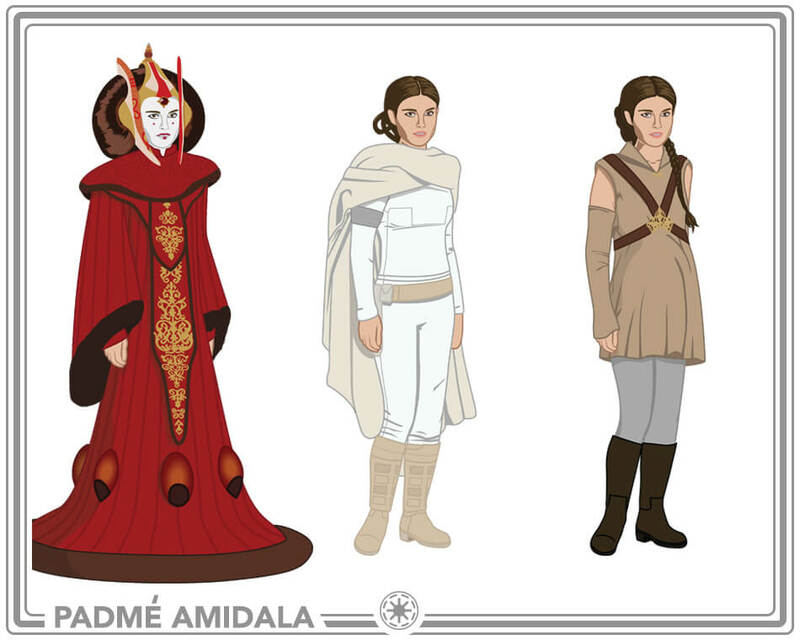 Padme Amidala has perhaps the most costume changes of any character in the Star Wars universe, but her evolution throughout the prequel trilogy outlines her evolution as a character. We first meet her as a Queen and her throne room gown conveys her regal nature perfectly. A wide-shouldered paneled gown, accented with gold embroidery, jewels, and an elegant fur hem were the key elements to this costume look. By the time of Episode II, she is both a Senator and an action hero in her own right, so her Geonosis costume is the most recognizable look of her new status. 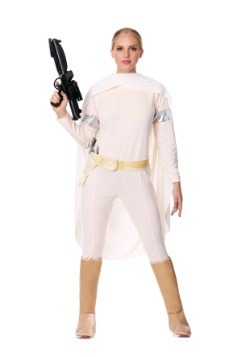 A simple white jumpsuit accented with an off-white shawl, accented by silver armbands, a tan utility belt, and action boots comprise this action ready outfit. 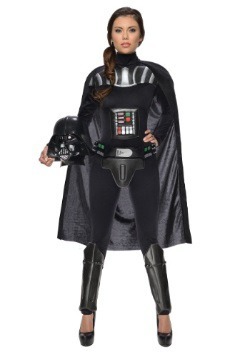 By the conclusion of the trilogy, she has both fallen for Anakin Skywalker and is carrying their unborn child, so her costume for her trip to Mustafar is simple and accommodating to pregnancy. A tan collared shirt outfitted by a leather crisscrossing harness, accented with gloves, gold clasps, and white pants finished this costume look. 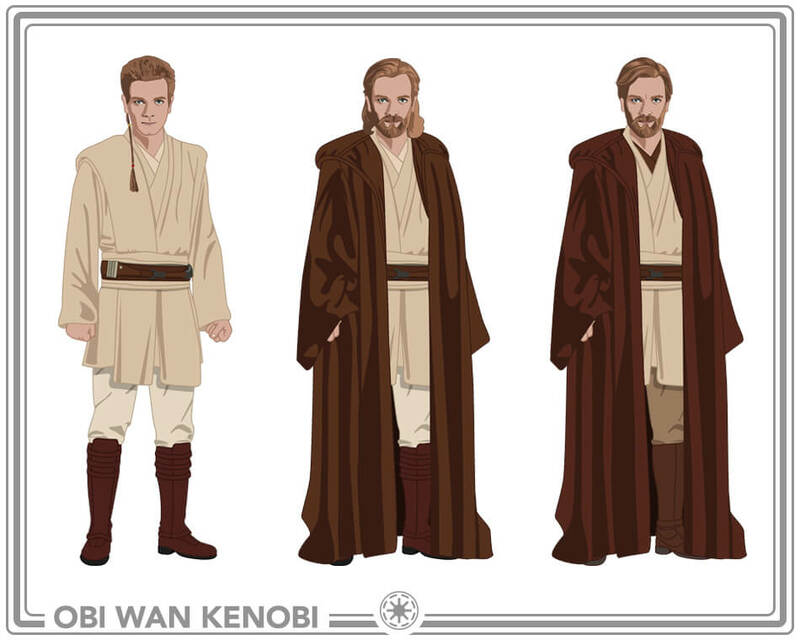 Obi-Wan Kenobi's prequel trilogy evolution starts from his status as a Jedi Padawan to becoming Anakin's Jedi master and ultimately his opponent at the conclusion. 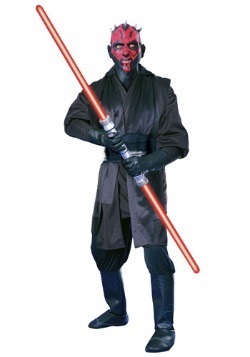 Starting with The Phantom Menace, Obi-Wan's costume was constructed to be similar to the one worn by the character in the original film. 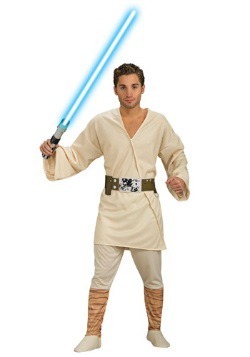 A tunic and tabard over plain white shirts and pants achieved this costume look. The tunic and tabard combo was constructed with a light woven fabric known as Indian homespun. 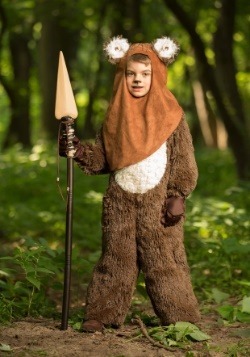 By the time he becomes a Jedi, he wears a vintage brown wool cloak that matched the one used by the character in A New Hope. 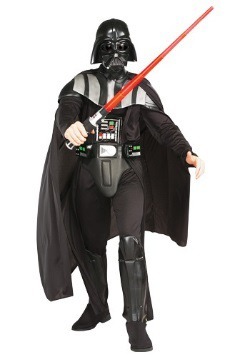 The only notable change in his costume look was an alteration of pant and undershirt color in Revenge of the Sith. He costume look in all of the films was accented with a leather belt and riding boots. 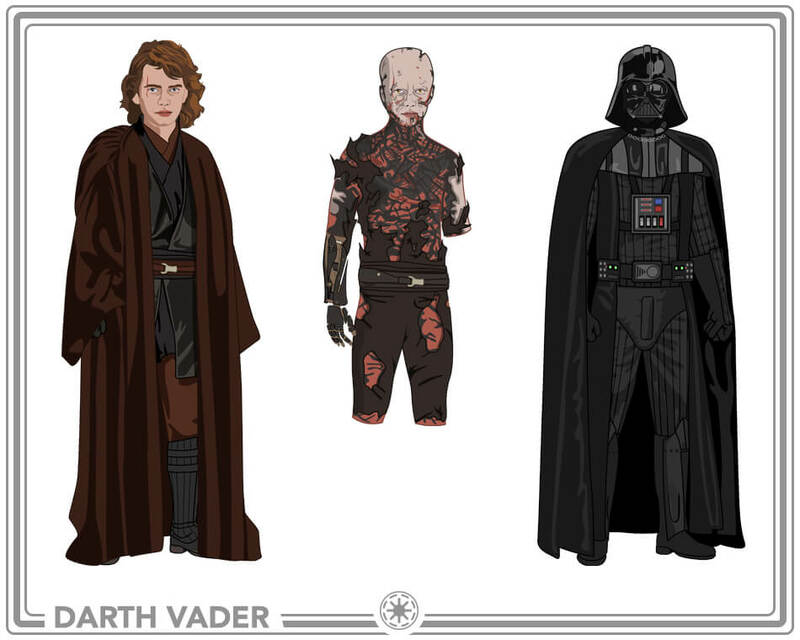 Anakin's journey through the prequel trilogy took him from humble slave beginnings to becoming the most feared villain in the Galaxy. When we first meet him as a child in The Phantom Menace, his slave costume served to convey his status, with coarse materials and a rough-hewn fabric material. 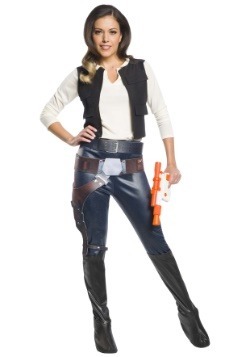 Ragged leg wraps, faux suede boots, and a leather utility belt rounded out the costume. A simple addition of a detailed helmet with attached goggles served him when he became a podracing champion. 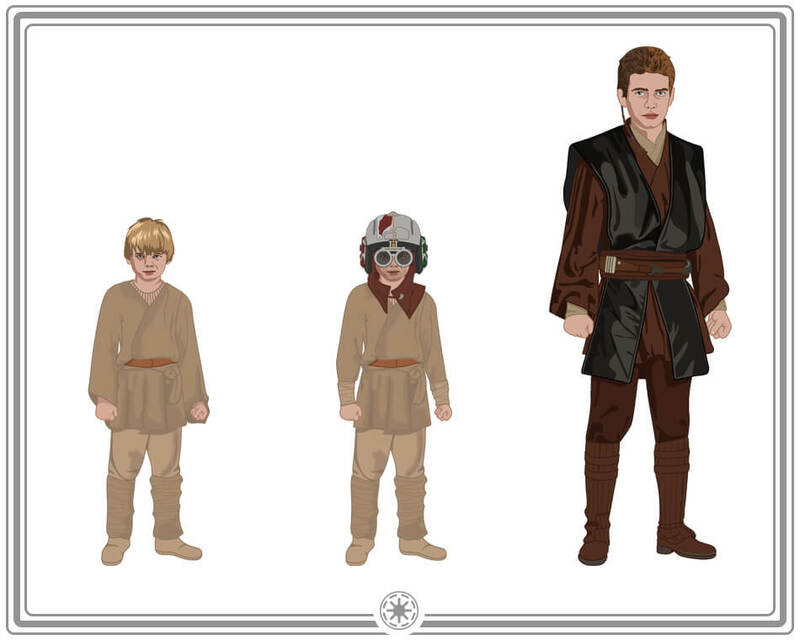 By the time of Attack of the Clones, Anakin had become a Jedi Padawan and wore a costume similar in style to the other Jedi, but of different construction. 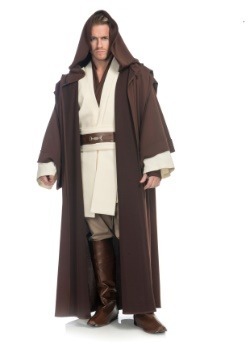 A leather tabard covered a darker hued tunic and pants with a belt and boots similar to Obi-Wan's. 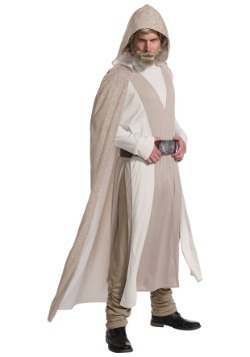 Only very slight color changes were implemented for Revenge of the Sith, but he was outfitted with the typical Jedi cloak. 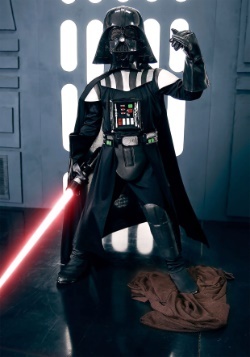 After turning to the dark side he nearly perished as Darth Vader, but was rescued and repaired by Palpatine. 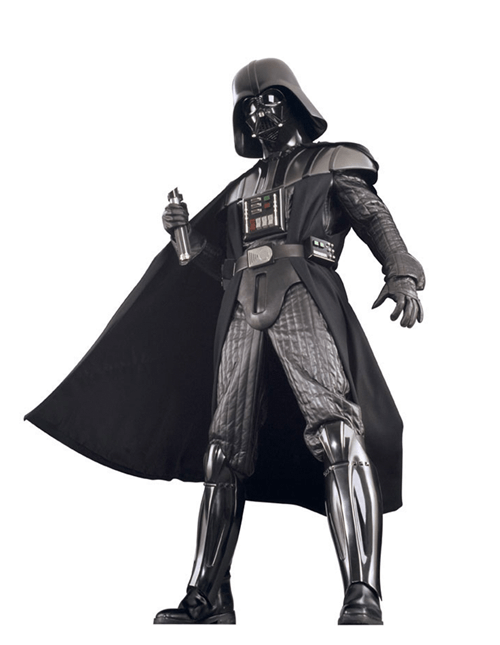 With the costume intended to be a mix of cybernetic technology and the powers of the dark side, the debut of the infamous Darth Vader support suit would complete his costume evolution. 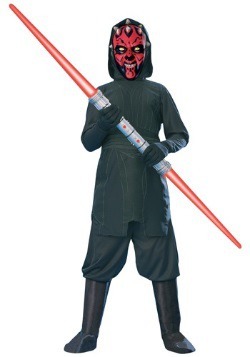 It's brief appearance at the conclusion of the prequel trilogy was an only slightly altered design from the costume used in the old films with a polished, brand-new effect added.